A common theme running through many recent articles, blog posts, and comments on issues of organizational performance is that managers/leaders are the problem: they are out of touch, they are arrogant and smug, they are selfish, and that they lack empathy or compassion. The gist being people in positions of power or authority should know better, be better. I agree with Rasmus Hougaard and Jacqueline Carter, authors of the piece “Why Do So Many Managers Forget They’re Human Beings?” in Harvard Business Review, that “As human beings, we are all driven by basic needs for meaning, happiness, human connectedness, and a desire to contribute positively to others.” This is so for the line-worker and the executive. I do not believe that anyone comes to work with the intent to make life miserable for another. But it happens. Why? Method, or process, or system, is essential in supporting our inner desire to live right. Organizations have organically evolved systems that directly conflict with and obstruct this desire. They’re so elaborate that even those supposedly in charge are trapped by it. This isn’t intentional, it happens. It is the result of everyone doing their best without constancy of purpose. I now realize that no one in the system sees the system, and everyone is confused by and frustrated with it. What can we do? We can all work to understand the system and share that with one another. Leaders can authorize that. However, we all are responsible for doing it. With shared understanding we can all work to redesign our system of work to humanize it. Again, leaders can authorize that, but we are all responsible for doing it. It is easy and comforting to divide ourselves into “us” and “them” and lay responsibility and fault on “them”. We’ve tried that; it hasn’t worked. Could we try something different? It’s not just the managers who forget they’re human. We all do. Recently, Harvard Business Review published a video called “The 5 Whys” where Eric Ries, author of The Lean Startup and The Startup Way, explains the use of the method. He repeatedly, and incorrectly, suggests to the viewer that “behind every seemingly technical problem is actually a human problem waiting to be found.” Finding a human who failed to be singled out for blame won’t find and fix the deficiencies in the process or system. What we need is to improve the design of the process or system within which humans work. The Toyota production system (TPS) was not designed. It grew out of “various efforts.” Often these efforts were “trial and error.” Experiments were run, lots of them. Some yielded desirable results, others did not. But lessons could be learned from every experiment—What worked? What didn’t? Why? What made an outcome of an experiment desirable? What was the purpose of these efforts? So how was productivity increased and costs reduced? Toyota guessed (or hypothesized) this could be done by “eliminating all kinds of unnecessary functions in the factories,” what we’ve come to term as waste. We all recognize there are many ways to produce the same result. However, some are less wasteful than others. They are efficient. By attending to what is actually happening, by observing the real process, a worker could identify waste in various forms. Observation comes before understanding. If we take a minute to think about how many different operations—small and large, localized and cross-functional—take place in factories, we start to understand the scale of Toyota’s effort. That takes patience, discipline and perseverance i.e. grit. The image of a bee hive or a migrating wildebeest herd or a flock of starlings comes to my mind. There is no centralized design or control, nevertheless all members work with the same purpose. To eliminate the causes of different types of waste, i.e. the unnecessary functions in the factories, Toyota devised solutions such as kanban, just-in-time, production smoothing, and autonomation. These methods are outcomes of a way of thinking and being. Experimentation through trial and error. They are the means Toyota developed to achieve its purpose of increasing productivity and reducing costs. They could be spread within Toyota, but can they be used elsewhere? Many examples exist of attempts to incorporate them in companies here in the West. I’ve had a front row seat to many of them. Few, if any, show the type of sustained benefits seen by Toyota. Why is that? Context! All companies operate within an environment: business climates (e.g. the regulatory environment), industrial relations (i.e. how companies relate to their peers and their suppliers, their communities, and the natural environment), and social systems (such as local traditions and customs). These will necessarily affect the type and form of tools that emerge from experiments that (should) happen in support of a particular company’s purpose. By the way, contrary to Ohno’s point, and as irrational as it seems, not all companies have the same final purpose as Toyota—to increase productivity and reduce costs. Similarly, people in the West have different objectives, different worldviews, than those in the East. 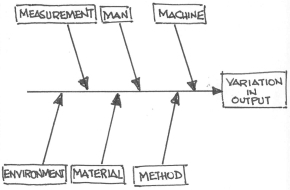 The Toyota production system, and perhaps even lean, is a way of being in pursuit of certain purpose(s). They are not a set of tools to copy and deploy independent of and indifferent to the context where they are deployed. It shouldn’t surprise anyone that efforts to unthinkingly copy and apply them fail more often than succeed. 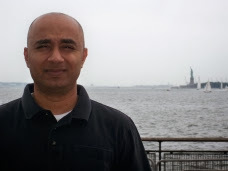 In my role as a quality engineer supporting product design and development at various medical device manufacturers I got practical experience with each company’s design and development process. As a matter of regulation, each medical device manufacturer has procedures that control the design of their products. Unfortunately, they are not particularly useful. I’ve observed that the Quality function at these companies develops and deploys all the procedures that the Quality System regulations require. However, professionals in the Quality function typically don’t have the subject matter expertise in a particular function such as product design and development or manufacturing to develop usable procedures for that function. This type of process, laid out in the order of the text of the regulation, would suggest that product design and development is a sequence of steps executed in series. At first glance it seems logical and sensible. First you catalog the user needs. Next you convert those user needs into design inputs (i.e. engineering requirements.) You then transform the design inputs through the design process into design outputs (i.e. drawings or prototypes.) Those design outputs are then verified (i.e. inspected and tested) against the design inputs. After that the design is validated by the user in the actual or simulated use environment. And finally, the design is transferred to manufacturing for mass production. 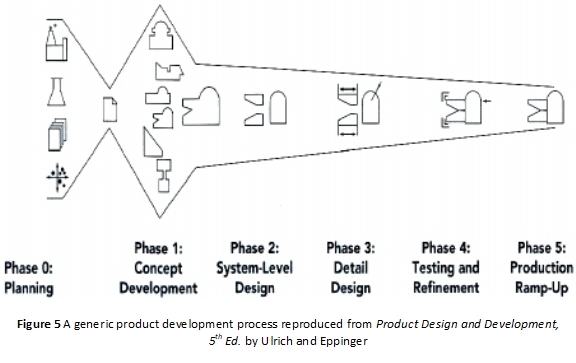 It wrongly suggests, albeit implicitly, that these steps also represent phases of design and development where a review is conducted after each block, and that a single traceability matrix, with columns corresponding to each block, is enough to capture the activity of the total design effort. I have tried to figure out how this would work for a design involving multiple components that are assembled together, but I cannot find a way. This type of design for the product design and development process is fatally flawed as it doesn’t model the real nature of products which is often components/systems embedded within systems. Trying to map the total design effort into this format is like trying to fit a square peg in a round hole, an impossible and ultimately frustrating exercise. Just because language is linear, in that ideas are expressed one after the other as the regulation does, doesn’t mean that the process being described is linear, too. In fact, the design and development process is most certainly not linear. It is deeply iterative with iterations built within iterations! 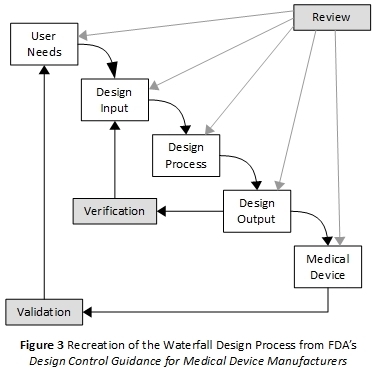 The FDA’s “Design Control Guidance for Medical Device Manufacturers” provides an explanation of the iterative nature of the design and development process. The guidance includes a simplified process flow chart, but it does not adequately communicate the complexity that makes up the actual design and development process. The guidance even explicitly says so. When the design input has been reviewed and the design input requirements are determined to be acceptable, an iterative process of translating those requirements into a device design begins. The first step is conversion of the requirements into system or high-level specifications. Thus, these specifications are a design output. Upon verification that the high-level specifications conform to the design input requirements, they become the design input for the next step in the design process, and so on. This basic technique is used throughout the design process. Each design input is converted into a new design output; each output is verified as conforming to its input; and it then becomes the design input for another step in the design process. In this manner, the design input requirements are translated into a device design conforming to those requirements. 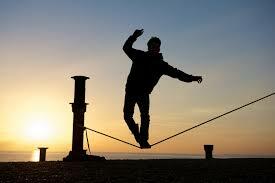 It’s obvious from the linked houses and the guidance that verification is not a one time or single type of activity. It is performed at each step of the design and development process wherever inputs are converted to outputs. Implicit in this point is that the type of verification is unique to the particular step or phase of the design and development process. Each house may be thought of as a phase of the design and development process. The houses offer natural breaks. The design process of the next phase, converting inputs into outputs, depends on the successful completion of the previous phase, so it is nearly impossible to move too far down the process as gaps will be immediately apparent! Each house can be considered its own traceability matrix where every design output is tied to one or more design inputs. 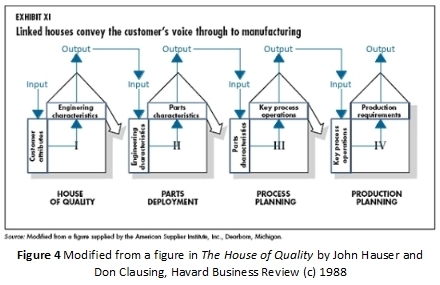 And because the houses are all linked to one another it is possible to trace an attribute of the manufactured product all the way back to the customer need it helps address. While they may not have a firm conceptual understanding of the design and development process, and thus cannot explain it, I believe most engineers have an instinctual feel for it in practice. But a poorly designed design and development process creates unnecessary and insoluble problems for project teams. The teams I’ve been on have responded to such hurdles by running two parallel processes: one that is the practical design and development effort, and the other is the documentation effort—a hidden factory. I don’t think it’s possible to calculate the cost of such waste. The House of Quality. Harvard Business Review, pages 63-77, Vol 66 No 3, May 1988. Product Design and Development, 5th Edition. McGraw Hill, 2016.